orman Rockwell collectible figurine , A Norman Rockwell classic. This is a porcelain, bisque, figurine titled "Norman Rockwell " The Runaway" Figurine Figurine was inspired by the September 10, 1958 Saturday Evening Post Magazine Cover. 1990 Dave Grossman Designs Figurine is in Perfect Condition with no box. Measures 6” tall; 4.5 wide” x 4.5” deep. 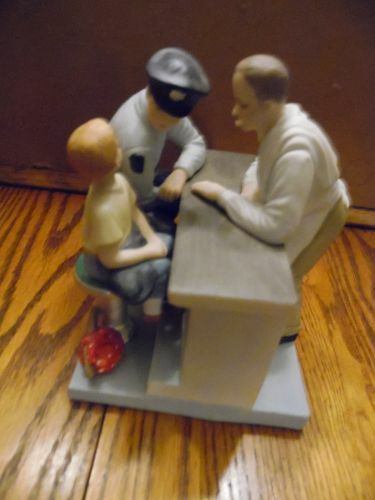 Figure shows a policeman sitting at a counter talking to a little boy. The little boy has a sack and stick and appears to be running away. There is a soda jerk looking on while he is smoking a cigarette. This piece is sought after and rare. This is a first edition and number 1461 of 7,500 pieces. I will be adding a lot of Rockwell items so check the catalog. I do combine shipping if you see something else. I pack extremely well, and No handling charges.